Why Did Support for Israel Become a Partisan Issue? Currently, fewer than 50% of Democrats say that they sympathize more with Israel than with the Palestinians. The sharp drop in the past year presumably is due to President Obama’s open feud with Prime Minister Netanyahu. What is striking to me is that the divide between the parties predates the Obama administration. In 2001, the parties were equal in their support for Israel, as Democratic sympathy jumped sharply. 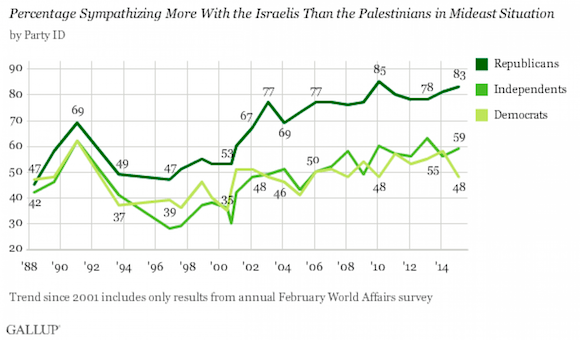 But after 2001, Republican support for Israel rose rapidly, while Democratic sympathy declined and then leveled off. The current divide between the parties–83% GOP support vs. 48% Democratic–is basically a continuation of that trend. So why did the parties diverge after 2001? Republicans became deeply concerned about Islamic terrorism after 9/11, and the vast majority saw Israel’s struggles with Palestinian terrorism to be another front in the same war. It is easy to see, therefore, why nearly all Republicans are sympathetic to Israel. Democratic reaction to 9/11 and ensuing events was more mixed. The “chickens coming home to roost” theory was accepted by some. Moreover, many Democrats who didn’t buy the more extreme version of that theory believed that our support for Israel was the cause (or a substantial cause) or radical Islamic anger toward the United States. Therefore, throughout the 2000s, when liberals offered alternatives to the Bush administration’s policies on Islamic terror, those alternatives generally came down to selling out Israel. That message seems to have gotten through to a considerable portion of the party’s rank and file. It is interesting, and a little surprising, I think, that President Obama’s hostility toward Israel doesn’t seem to have been a major factor in driving opinion within his party, at least not until his open conflict with Netanyahu last year. Perhaps most Democrats didn’t recognize Obama’s hostility until then, preferring to believe his professions of friendship. Or perhaps his coolness toward Israel reflected the views of many Democrats from the beginning. The Gallup data support that conclusion. In any event, it is unfortunate that support for Israel has become a partisan issue. I don’t think that is the case with respect to any other ally; certainly not to the same extent.